For fans of fine dining, the only thing more enjoyable than enjoying gourmet cuisine is enjoying it in attractive surroundings. Architectural Digest has a great gallery of some of the most beautifully designed new restaurants in the world. Take a look at this list of some of our favourite incredibly designed restaurants. Restaurants which make use of interactive tables are becoming increasingly common, but they are not always well implemented. 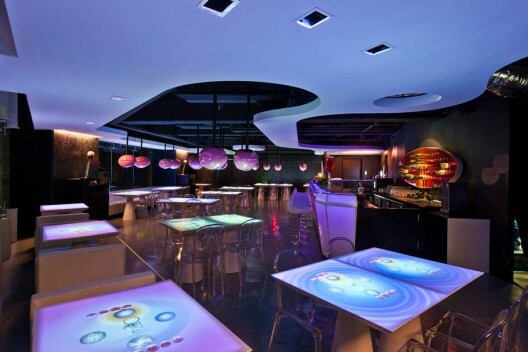 The Mojo iCuisine Interactive restaurant in Taipei has turned interactive tables into a stylish and enjoyable experience. The design of the restaurant is clean, soft and universally hi-tech, and the tables are integrated into the design, rather than simply an afterthought. In addition to the usual menu options and tabletop games, the software even allows you to change the digital “table cloth”! The entire design of this restaurant, from the seating and tables to the wall and ceiling, is inspired by origami. The colours and materials chosen are all designed to compliment this look, with translucent stone panels, linen and perforated aluminium all brought together to create a sleek and stylish looking restaurant. What better way to get a taste of the orient than to dine in an Origami themed restaurant? This interesting restaurant was designed by PAL Design Consultants. The architects faced several challenges when designing this restaurant, which is a stark departure from traditional Chinese restaurants, not least because of the unusual layout and the resulting lack of natural light in the venue. 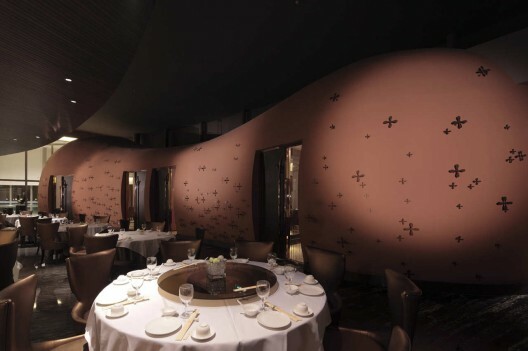 The restaurant was designed around the concept of “Sweet Osmanthus” – an unusually shaped flower pattern which is supposed to reflect the youthful personalities of the clientele that the restaurant is trying to reach. The decor and the layout of this restaurant are both triumphs of architectural ingenuity. The Tsujita artisan noodle restaurant in Los Angeles California has a unique atmosphere. Instead of simply adopting a traditional Japanese restaurant decor, designer Takeshi Sano has gone one step further, painstakingly positioning 25,000 wooden sticks of varying lengths on the ceiling. These sticks create the impression of sitting under a cloudy sky. If you’re passing through Los Angeles, then this is a good place to visit for delicious Japanese dining at an affordable price. This unique treehouse restaurant was designed by architectural company Pacific Environment Architects. The treehouse was designed to capture the imagination of the diners, creating a fairytale atmosphere and allowing visitors to live out their childhood dreams while still enjoying fine dining. 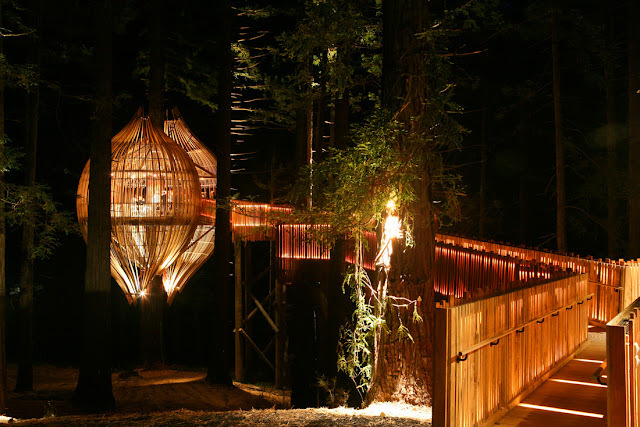 To truly enjoy the amazing experience of dining in a treehouse, visit late in the evening, when the glowing treehouse looks like something from a children’s tale. Over the years, there have been some beautiful and exotic restaurants created, however many of those restaurants no longer exist. Tommy Hilfiger’s People’s Place closed down after 25 years, and the beautiful and glamorous Bei Restaurant in Beijing is also closed. This is only a very small snippet of some of the great architecture but if you’re a fan of interesting design and dAi? ?cor (and of course food!) then these restaurants really are worth the visit.